Connect the two swivel hooks on the harness to the loop connectors on the instrument. 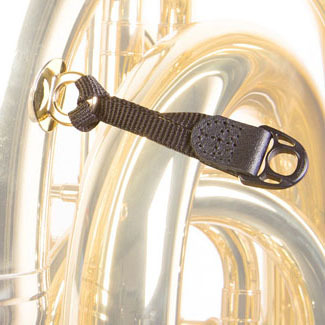 The Pad-It Tuba Harness™ is the ideal accessory for tuba players who wish to stand or march while playing. It features comfortable shoulder pads with high-tech memory foam that conforms to your shoulders for the best weight distribution of the instrument. 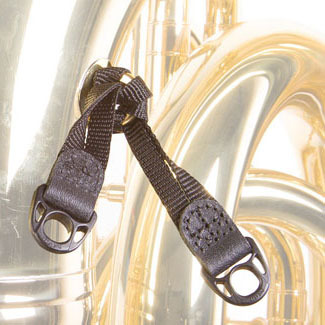 The Pad-It Tuba Harness™ is the ideal accessory for tuba players who wish to stand or march while playing. It features comfortable shoulder pads with high-tech memory foam that conforms to your shoulders for the best weight distribution of the instrument. The memory foam is designed to wick moisture away from the skin to keep you cooler and more comfortable during longer playing sessions. With numerous points of adjustment, the Pad-It Tuba Harness™ is capable of providing a truly custom fit for most any body type and tuba. Its unique design better balances the weight by simply moving the Weight Distribution Adjustment Connectors (see photos). This moves the instrument's weight to be more upright and stable instead of allowing the instrument to fall forward away from the body. 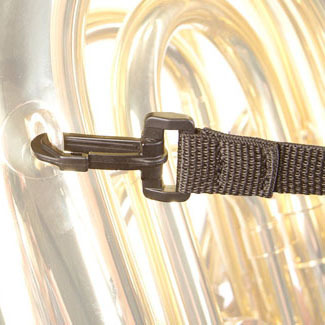 There are also several attachment options to accommodate tubas with a variety of strap ring configurations. This built-in versatility is particularly nice for musicians with multiple instruments. 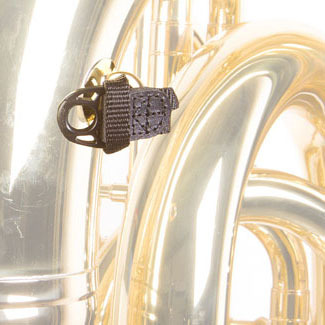 With Neotech's Pad-It Tuba Harness™, musicians are free to concentrate on making great music instead of holding onto their tubas! It's sure to become the "must-have" accessory for every tuba player. 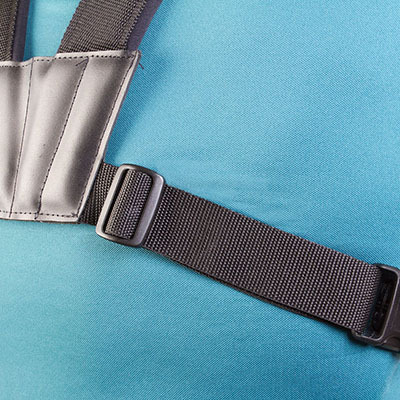 Pad-It Tuba Harness™ Instructions: The Pad-It Tuba Harness™ has many areas of adjustment which allow you to customize the fit for maximum comfort. 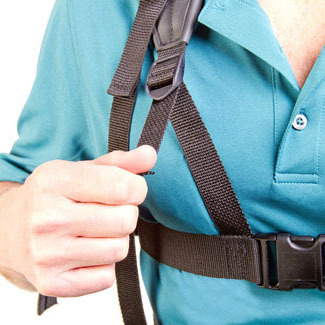 Once it's adjusted to your liking, you will be able to get in and out of the harness in just a few seconds. 1. 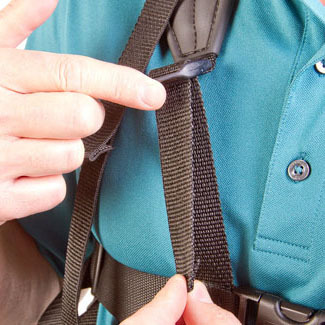 Begin by unfastening the center quick disconnect and hold the harness by the two shoulder pads. 2. Place your arms through the openings with the pads resting on your shoulders. 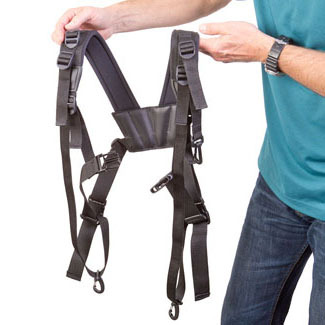 Putting on the Pad-It Tuba Harness™ is very much like wearing a vest. 3. Fasten the center quick disconnect. 4a. Position the torso strap so it fits just below the sternum. 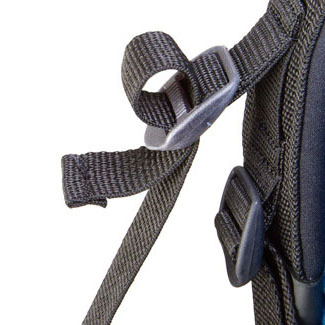 You can adjust the torso strap higher on the body by pulling the two webbing tabs as shown. 4b. 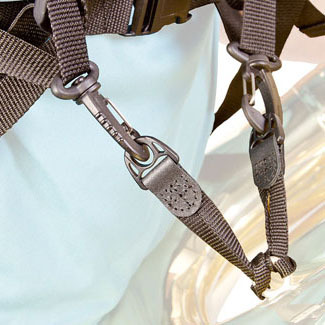 To adjust the torso strap lower on the body, simply lift the ladder-lock connectors as shown and the webbing will freely adjust to the longer length required. 5a. 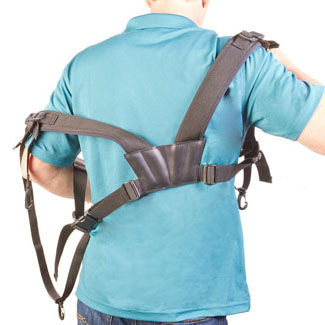 Set the main adjustment for the torso strap by using the two triglide connectors which are located furthest to the back of the harness. 5b. 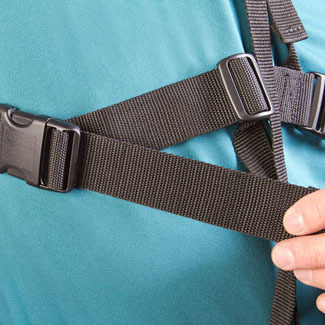 Minor adjustments to the torso strap can be made by using the two triglide connectors located at the side quick disconnects. 6. 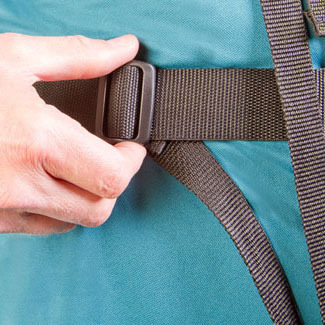 Once the torso strap is adjusted properly for fit, you can fine-tune the position of the Weight Distribution Adjustment triglides located on each side of the center quick disconnect by moving them toward the back. This maximizes the support of the instrument once attached. 7. 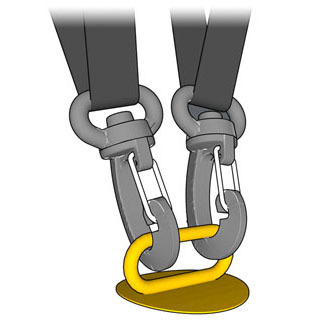 Option 1: If the instrument has a large enough connector ring at the bottom, you may simply clip the two swivel hook connectors directly to it. a) Thread the nylon webbing loop through the ring on the instrument. 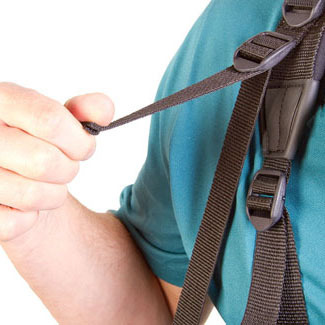 b) Pass the plastic part through the webbing loop. c) Pull the plastic part to tighten the knot. d) Repeat with second loop connector. e) Connect the two swivel hooks on the harness to the loop connectors on the instrument. 8. 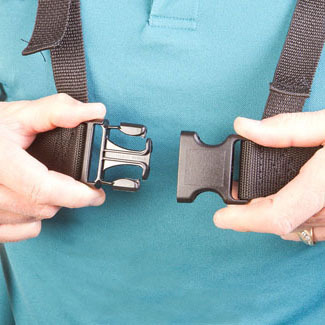 Adjust the length of the straps using the same method as described in step 4. 9a. For added stability, attach the upper strap to the instrument's top strap ring. 9b. 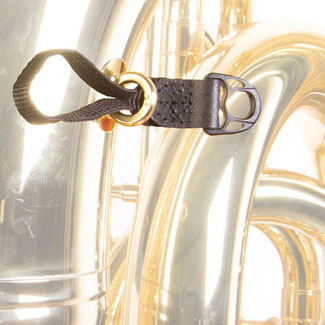 Depending on the instrument's ring position and your preferred playing position, this strap may need to be moved to the opposite side of the harness. In this case, simply unthread the strap and rethread it on the opposite side.